Laboratoire de Photonique et de Nanostructures, Marcoussis, France. It is well known in neurophysiology textbooks (see e.g. ) that neurons are biological excitable systems possessing an absolute and a relative refractory period. These properties are fundamental for the propagation of nerve impulse and for information processing in the brain. Excitability is a generic property that is also found in biological , chemical , and optical systems . An excitable system possess a rest state. If perturbed above a certain threshold - the excitable threshold - with a single perturbation, it emits a pulse with a characteristic shape (light pulse in optics, electrical pulse in neurons). If perturbed with two successive pulses above the excitable threshold, it can respond by emitting two identical pulses if the perturbation pulses are well separated temporally. It can emit a unique pulse if the second perturbation occurs too early after the first one : we are then in the absolute refractory period. However, in an intermediate regime, the relative refractory period, it is possible but harder to trigger a second response and this second response is inhibited and has smaller amplitude. 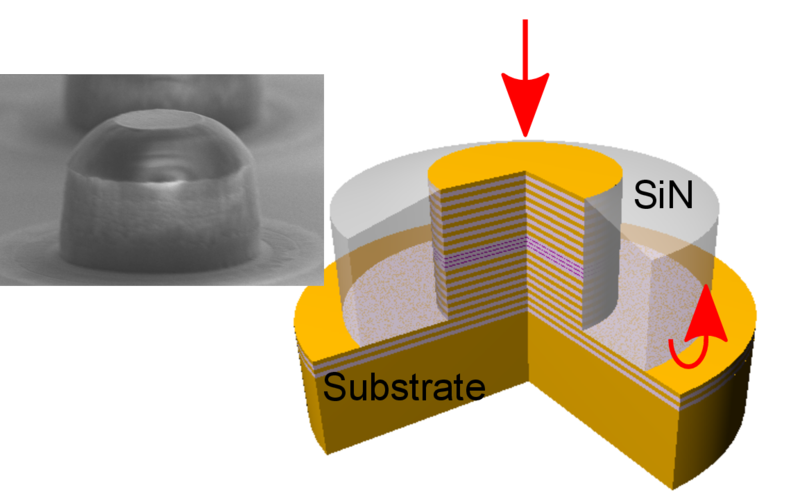 Figure 1: Schematic representation and SEM image of the micropillar laser with embedded saturable absorber. The pillar microcavity is coated with a thick, 2 microns, layer of SiN. The active zone is sandwiched between two aperiodic multilayer mirrors and is composed of a gain and an absorber section made by respectively 2 and 1 quantum wells. The laser emits around 980nm and is 4μm in diameter. Our system is a special kind of micropillar laser embedding in its center a saturable absorber, and optimized for optical pumping . Semiconductor lasers are interesting systems for the study of excitability [2, 3, 6, 7, 14-19] since they can have a small footprint and have short timescales. They can thus lead to short response times, necessary in view of their utilization in a neuromorphic information processing context. It was also recognized recently that microlasers with saturable absorber can work as leaky integrate-and-fire laser neurons  paving the way to fast cognitive computing. We have shown in  that a micropillar laser with saturable absorber is a fast excitable unit with an absolute, and for the first time, a relative refractory period. The response time is of the order of 200ps, similar to the absolute refractory period, and the relative refractory period is about 350ps. This demonstrates that this system behaves analogously to a neuron but with much faster timescales (sub-nanosecond vs millisecond). The existence of a relative refractory period proves that the system keeps memory of its past state. Contrarily to a common belief, the excitable threshold is not a constant of the system and may be controlled either externally, via the bias pumping of the system, or dynamically via the past state memory. These properties can be utilized for neuro-mimetic optical processing of information, for instance by coupling several micropillar lasers together for building logic gates  or for neuromorphic processing [9,10]. Adrian Jacobo, Damià Gomila, Manuel A Matías, Pere Colet, "Logical operations with localized structures". New Journal of Physics, 14, 013040 (2012). Abstract. Stéphane Barland, Oreste Piro, Massimo Giudici, Jorge R. Tredicce, Salvador Balle, "Experimental evidence of van der Pol—Fitzhugh—Nagumo dynamics in semiconductor optical amplifiers". Physical Review E, 68, 036209 (2003). Abstract. Maia Brunstein, Alejandro M. Yacomotti, Isabel Sagnes, Fabrice Raineri, Laurent Bigot, Ariel Levenson, "Excitability and self-pulsing in a photonic crystal nanocavity". Physical Review A, 85:031803, 2012. Abstract. T. Elsass, K. Gauthron, G. Beaudoin, I. Sagnes, R. Kuszelewicz, S. Barbay, "Control of cavity solitons and dynamical states in a monolithic vertical cavity laser with saturable absorber". Euro Physics Journal D, 59, 91 (2010). Abstract. F. Plaza, M. G. Velarde, F. T. Arecchi, S. Boccaletti, M. Ciofini, R. Meucci. "Excitability following an avalanche-collapse process". Europhysics Letters, 38, 85 (1997). Abstract. M. Giudici, C. Green, G. Giacomelli, U. Nespolo, J. R. Tredicce. "Andronov bifurcation and excitability in semiconductor lasers with optical feedback". Physical Review E, 55, 6414 (1997). Abstract. D. Goulding, S. P. Hegarty, O. Rasskazov, S. Melnik, M. Hartnett, G. Greene, J. G. McInerney, D. Rachinskii, G. Huyet, "Excitability in a Quantum Dot Semiconductor Laser with Optical Injection". Physical Review Letters, 98, 153903 (2007). Abstract. J. D. Murray. Mathematical biology. Springer, New York, 1990. Wolfgang Maass, Thomas Natschläger, Markram Henry, "Real-Time Computing Without Stable States: A New Framework for Neural Computation Based on Perturbations". Neural Computation, 14, 2531-2560 (2002). Abstract. M.A. Nahmias, B.J. Shastri, A.N. Tait, P.R. Prucnal, "A Leaky Integrate-and-Fire Laser Neuron for Ultrafast Cognitive Computing". IEEE Journal of Selected Topics in Quantum Electronics, 19(5), 1-12 (2013). Adolphe Pacault, Patrick Hanusse, Patrick De Kepper, Christian Vidal, Jacques Boissonade. Phenomena in homogeneous chemical systems far from equilibrium. Accounts of Chemical Research, 9(12), 438-445 (1976). Abstract. D. Randall, W. Burggren, K. French, R. Eckert. Eckert Animal Physiology. W. H. Freeman, 2002. Google Book. F. Selmi, R. Braive, G. Beaudoin, I. Sagnes, R. Kuszelewicz, S. Barbay, "Relative Refractory Period in an Excitable Semiconductor Laser". Physics Review Letters, 112, 183902 (2014). Abstract. Stefano Beri, Lilia Mashall, Lendert Gelens, Guy Van der Sande, Gabor Mezosi, Marc Sorel, Jan Danckaert, Guy Verschaffelt, "Excitability in optical systems close to Z2-symmetry". Physics Letters A, 374, 739 (2010). Abstract. 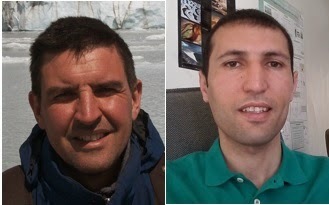 Sylvain Barbay, Robert Kuszelewicz, Alejandro M. Yacomotti. Excitability in a semiconductor laser with saturable absorber. Opt. Lett., 36(23):4476—4478, 2011. Abstract. Thomas Van Vaerenbergh, Martin Fiers, Pauline Mechet, Thijs Spuesens, Rajesh Kumar, Geert Morthier, Benjamin Schrauwen, Joni Dambre, Peter Bienstman, "Cascadable excitability in microrings". Optics Express, 20, 20292 (2012). Abstract. Sebastian Wieczorek, Bernd Krauskopf, Daan Lenstra, "Multipulse Excitability in a Semiconductor Laser with Optical Injection". Physical Review Letters, 88, 063901 (2002). Abstract. H. J. Wünsche, O. Brox, M. Radziunas, F. Henneberger, "Excitability of a Semiconductor Laser by a Two-Mode Homoclinic Bifurcation". Physical Review Letters, 88, 023901 (2001). Abstract. A. M. Yacomotti, P. Monnier, F. Raineri, B. Ben Bakir, C. Seassal, R. Raj, J. A. Levenson, "Fast Thermo-Optical Excitability in a Two-Dimensional Photonic Crystal". Physical Review Letters, 97, 143904 (2006). Abstract.